Urban Initiatives – Meet Team Tilly! 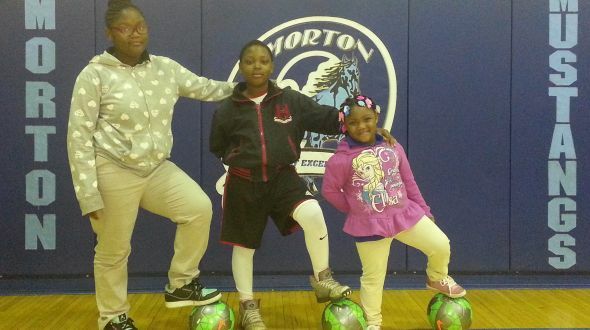 Coach Nefeteri checks-in with a special blog about a trio of siblings at Morton School of Excellence. This Fall, Work to Play returns to Morton School of Excellence for the sixth year running where Coach Ryan Trauger or “Coach T” as the kids call him, has been the On Site Program Director for the past two years. Because of Coach T’s great connection with Morton students, Coach Trauger recruited a trio of fun, the Tilly siblings. I recently asked “Team Tilly” if the Work to Play program is as fun as they thought it would be, with smiles from ear to ear they all shared some of the great times they have had. Jariyae stated how much pride she takes in being a Team Captain and how much fun Take the Lead retreats are because she gets to meet new kids her age. Jounta loves getting to know other Work to Play soccer players from nearby neighborhood schools like Jacob Beidler Elementary School and Michael Faraday Elementary School. Janiyah loves when her big brother and sister teach her new soccer moves. “Team Tilly” also shared how their parents Jounta Sr. and Mesha Tilly enjoy coming to watch their children play at Friday Game Days and appreciate the health and character lessons they are learning each week. It is a great joy to coach the Morton Mustangs and having the opportunity to know “Team Tilly” has made the Work to Play and Take the Lead programs as strong as ever!